Modern monitors have MagicRotation function, such as the Samsung is MagicRotation Auto. As the name suggests, it is the turn function. How it works: in the computer set the special program, the monitor has a built-in sensors to track the position of the monitor. If you want to rotate the screen vertically, rotation information will be transferred to your computer and automatically happen with a change position of the image can be said horizontal landscape leaf on vertical position. The adjustment can be done manually by going to the Settings screen and apply the desired function, but automatically it easier. This feature has long implemented in tablets and smartphones. When this feature is useful if you are working with tables that habitually use the horizontal position of the monitor. Some tables is best viewed on a vertical screen. When using the Internet more comfortable watching sites on the monitor screen to a vertical position, as the sites are built with vertical scrolling. 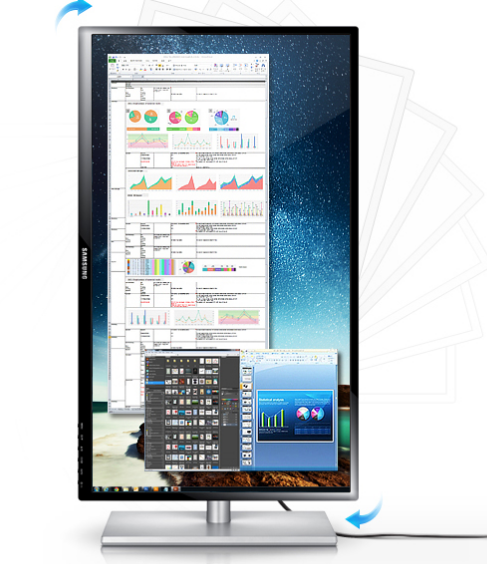 Display resolutions modern monitors allow you to work comfortably with any provision of the screen. Quite nice but rarely used feature.